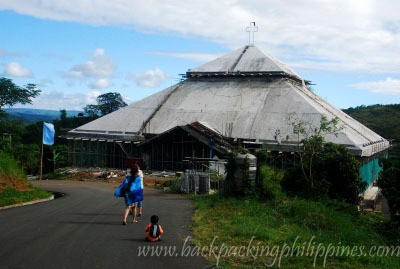 An unplanned trip to the upland hills of Sampaloc, Tanay, Rizal, on the prodding of Tutubi's sister who hitched along on his way to Quezon City turned out into another "joy of discovery" adventure with a place, heard of by Tutubi in 2010 yet forgot to check it out, that features a 71-feet giant statue of Mother Mary, that's been drawing a steadily increasing hordes of pilgrims (and tourists) to the windy place similar to how Kamay ni Hesus is attracting catholic devotees to Lucban, Quezon. 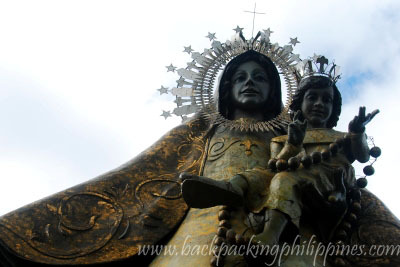 Regina RICA features a 71-feet tall statue of Regina Rosarii (Queen of the Holy Rosary), called "Our Lady on Top of the Hill" by Dominican Sisters of Regina Rosarii, who also commissioned scuptor Jose Barcena, Jr. to sculpt the giant statue. 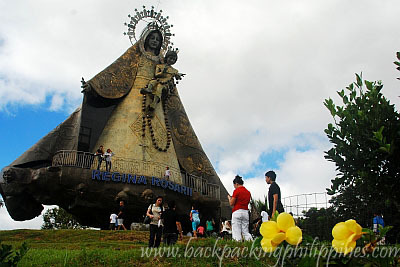 Regina RICA's official website declares "The first Regina Rosarii Shrine in the Philippines is at the Dominican Heights, Tagum Davao. Jose Barcena Jr., Jojo our artist and sculptor depicted our Lady like Our Lady of la Naval. The second Regina Rosarii Statue is at the Rosary hill in Tagaytay. The third Regina Rosarii statue is the 30 –foot revolving statue on top of the roof deck of the motherhouse of the Dominican Sisters of Regina Rosarii." Photography/Taking Pictures: allowed in all areas except inside the Regina Rosarii chapel. Bringing of food: forbidden, it's a pilgrimage place, for pilgrimage, prayer and contemplation and not for picnics and parties. there's a restaurant (Pasilungan) where you can have buffet meals or short orders for food and drinks. Overnight Accommodations: no hotel nor overnight accommodations here for guests and visitors. Not designed as a wedding venue nor party venue for debuts and birthdays. 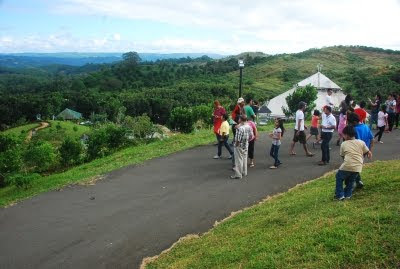 there are may resorts in Tanay, Rizal where you book your garden wedding venue and party events. Future amenities though include rooms for retreats, recollections and seminars. parking: ample street parking though some areas are sloping. Wonder how it's like during Holy Week (Holy Thursdays for Visita Iglesia), Good Friday, Black Saturday or Easter Sunday though, the place must be a mountain full of people. Regina RICA's official website already has driving directions to Regina RICA on how to get there. A more detailed map of Regina RICA will soon be available on OpenStreetMap for your GPS devices once Tutubi gets hold of precious time to upload tracks and waypoints. For those without cars and afraid of long cummute to Regina RICA, you can call telephone number +63.2.372.5327 to reserve a seat for a shuttle service tour with food for only PhP350.00. Shuttle departs 7am at RICA main in Quezon City and leaves Regina RICA at 4pm. 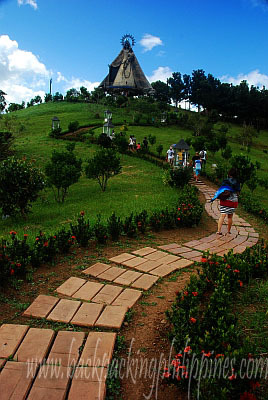 Travel time is about 1.5 hours from Quezon City. Location: 70 Scout Fernandez St. Barangay Laging Handa, Q.C. thanks for sharing this. i haven't seen this place on other blogs before. i'll keep this in mind. happy new year. health and wealth this new year. thanks for your informative posts and am grateful for your visits to my blog last year. Wow the Catholic and the Spanish heritage look really strong there. i went here last october 7 2010 it was the first year or regina rica at sampaloc tanay... i love this place specially if you are on the top of the hill..... youo will see the nature good place for pilgrimage..